Two years after receiving severe beatings till blood started oozing out from both the mouth and the nose but still handcuffed and dumped in cell for two days by the Half Assini police, Mr. Peter Akossey, the victim of this brutality, has still not received justice from the Inspector General of Police (IGP), Nana Owusu Nsiah, who was petitioned. Poor Akossey, a corn mill operator at Half Assini, collapsed in the police cell as a result of the brutality and was rushed to the Half Assini government hospital, still in handcuffs, to receive medical attention. He was later transferred to the Takoradi government hospital where doctors operated upon him to remove blood from his abdomen where the peace officers reportedly stepped several times during the assault. According to Akossey, who spoke to The Chronicle recently, though he had sent several petitions to both the regional command of the police service and the IGP, Nana Owusu Nsiah, himself, nothing good had come out of it because he had nobody to fight for him. He said he incurred a medical bill of four million cedis, which his poor family had to struggle to pay, apart from the chronic abdominal pains he had gotten now. 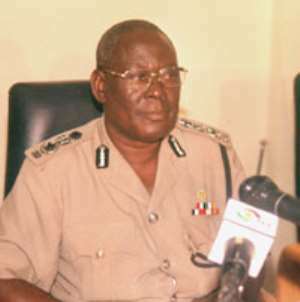 The victim further told The Chronicle that though what to eat was a problem for him since he was no more having the strength to work, he had had to travel all the way from Half Assini to the police headquarters in Accra several times to pursue the case, but up to date, nothing concrete had come out of it except 'go and come' messages. “Does it mean that in Ghana, when you are poor, you cannot get justice?” he asked, and added that the brutality he suffered at the hands of the eight police officers who tied his hands to the back, amid slapping and stepping on his abdomen, could not have happened to any rich man's son but because his parents were poor farmers, the police administration was not paying any attention to him. According to him, he was advised to hire a lawyer to fight the case for him since the police nearly truncated his life but the one he consulted started dragging her feet when she apparently realized that he was not having money to pay for the legal service. He recalled that on July 21, 2003 a certain boy approached him with a car tape recorder to buy because he needed money to take care of his sick mother. Akossey said after bargaining, they settled on ¢150,000 because there was some repair work he had to carry on the tape. He alleged that when he demanded the receipt covering the tape, the boy said he had left it at home and promised to bring it the following day. Akossey said because the boy claimed he needed money to take care of his sick mother, he gave him ¢60,000 out of the amount and took the tape with the promise to pay the remaining amount if he brought the receipt to him the following day as the boy himself had promised. He further narrated that on the appointed day, the boy came to take the remaining amount from him but failed to produce the receipt he had agreed to bring along. Based on this, he gave the tape back to him and demanded his advance payment back. The boy readily gave his money back to him and took his tape away in the presence of some witnesses. According to him, later in the day, a police car pulled up at his work place with the boy in handcuffs. The police then asked him to accompany them to their station because the boy claimed he had sold the tape, which had then been established to be a stolen item, to him. He said in the presence of the police, he asked the boy whether he did not return the tape to him after failing to produce the receipt, to which the boy responded in affirmative. Yet though the boy exonerated him, the police still took him to the police station and locked him up in their cell without bail. Those who saw him handing the tape back to the boy came to testify on his behalf but the police would still not listen to them. Akossey said while in detention, one day, the boy's family brought him food and he also lost his temper and took the food away from the boy on the grounds that he (Akossey) had refused to take food and would not allow him to also take any food for the unjustified allegation he had leveled against him. This, he continued, resulted in a fight between him and the boy in the cell but the other inmates separated them. He said a few minutes later, the police brought him out from the cell to the charge office and tied his hands to the back; with his throat held tightly, the officers, who were on duty at that time, started to beat up him till blood began oozing from his mouth and nose. They trampled also on his abdomen several times. He mentioned the policemen who took part in the beatings as CID Inspector Bogoroh, Thomas Barfo, David Fianoo, Inspector Anaman, Foster, Wisdom and Samuel. Despite the blood oozing from his mouth and nose, the aforementioned policemen handcuffed and dumped him in a cell but he collapsed and was rushed to hospital at Half Assini, from where he was transferred to the Takoradi Hospital, known locally as European Hospital, where emergency operation was performed on him to remove blood from his abdomen. According to him, after his discharge from the hospital, he petitioned the regional command of the police service and the IGP but for two solid years, they had done nothing about his petition despite several reminders, including personal visits to the police headquarters in Accra. He said he has now developed an ear problem because of the way he was slapped several times and despite the operation, he still feels pains in the abdomen.